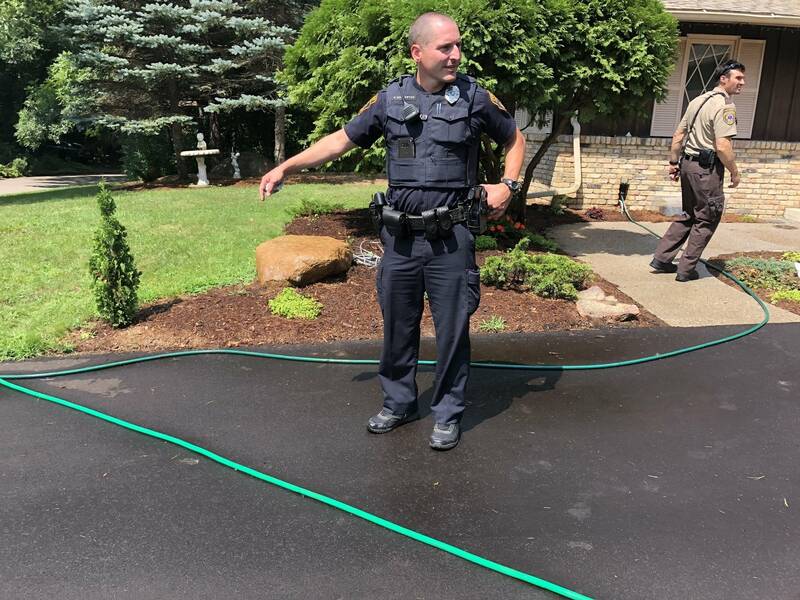 Officer Patrick Eggleston cruises the wooded streets of Minnetonka, an affluent suburb in the western Twin Cities. Dispatch continually breaks in on the squad radio. On this day it's quiet. But Eggleston says you can never predict how a shift is going to go. "Whether it's somebody calling in because somebody is breaking into their car and we're chasing after the suspect, or whether it's somebody who is in a complete mental health breakdown where they're looking to end their life," Eggleston said. "You can't treat each situation the same." In his left pocket, the Minnetonka officer carries a stack of business cards. The card lists four contact numbers for services that help people experiencing a mental health crisis. It's simple and low-tech. But Eggleston said that just the week before, he called one of the organizations to get help for a man who was hallucinating. He said the card has given officers more options than just sending someone to the hospital or walking away. "Police officers respond to the crisis now," Eggleston said. "This helps out with that long-term solution." The business cards are one way to try to get people in crisis help before a situation gets out of hand. They were created for a training program launched in Minnetonka earlier this year. The researchers who created it hope it might provide an accessible and effective model for de-escalation training at other departments around the state. A law requiring and funding de-escalation training for every police officer in Minnesota took effect last year. Minnetonka Chief Scott Boerboom said his email soon started filling up with pitches from training programs that claimed to fulfill the new requirements. When Boerboom was first approached by Hamline University professor Jillian Peterson and Metropolitan State University professor James Densley, he noticed they didn't begin by telling him what they wanted to teach in the program. Instead, they asked what his department of 57 sworn officers wanted to get out of a de-escalation training, and they offered to develop a tailored approach based on what they needed. "They pitched the concept to me, and to be quite honest with you, I thought they had a great plan," Boerboom said. "And I just said, 'Let's do it.'" Boerboom told the researchers he wanted to explore how officers could respond differently to crisis calls, lower the number of emergency calls and reduce how often officers used force. Most other de-escalation training programs come from a purely law enforcement perspective, often employing former cops as trainers. Lately there's been a move to incorporate more perspectives into policing practices, including by the city of St. Paul, which is bringing mental health social workers into the city's police department. Peterson, a psychologist, and Densley, a sociologist, wanted to apply techniques that were effective in other professions like teaching and nursing. "We've learned a lot in the last 20 years about mental illness, about police training and about what works in crisis intervention," Densley said. Peterson said the lessons from other professions showed that sometimes de-escalation can be as simple as changing the lighting in the room or turning off a television. • Previously: How efficient are the de-escalation techniques used by police? "I used to work a long time ago on a suicide prevention hotline and we use the metaphor of a person who is suicidal in a suicidal crisis as a balloon that's ready to pop," Peterson said. "All you need to do is take a little bit of air out of the balloon to get them through that moment." 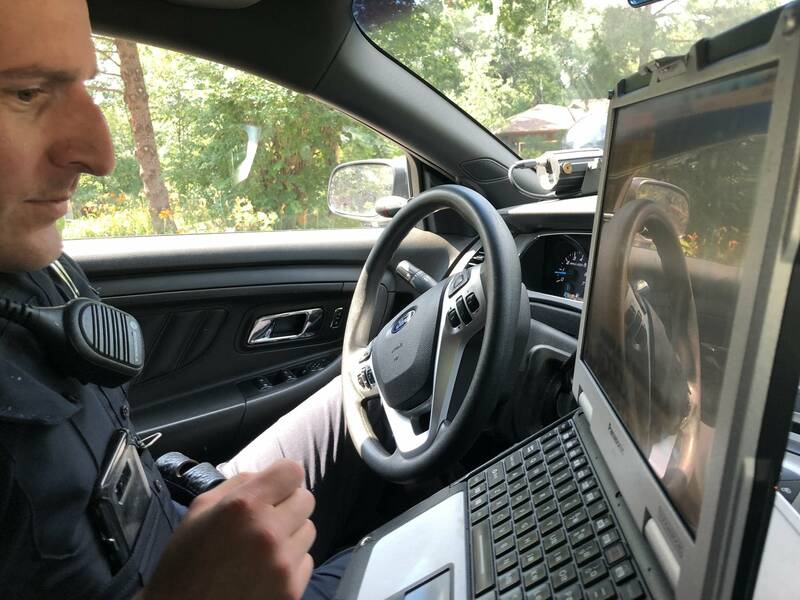 Peterson and Densley wanted to ground their de-escalation training in the realities of the Minnetonka department, so they rode along in squad cars with Minnetonka police officers as they patrolled. "Let's have the training actually reflect what day-to-day policing looks like," Densley said. "So, yes, you want people to be proficient with firearms, but the likelihood of them using a gun on a given day is very, very slim, so let's emphasize some other things as well." The researchers interviewed people who had gone through a mental health crisis, as well as their families. They even spent a day sitting at a psychiatric inpatient clinic, watching as patients got in and out of ambulances. "We tried to really see what is out there," Peterson said. 'What's working? What's not working?" Police are often one of the first calls when someone is experiencing a mental health crisis. But they aren't equipped to diagnose and treat people. Minnetonka, like other cities around the country, have seen increasing numbers of crisis calls. "Many times when we go into these calls, we're not able to help them and they're unwilling to get help themselves it does get frustrating," said Eggleston. "Those are usually the ones that we end up taking multiple calls on." When he went into policing seven years ago, Eggleston said he wasn't expecting to deal with so many people in crisis. It's alarming to see people get stuck in a cycle. "We're not going to figure it out if we just sit there and talk," Eggleston said. "If we can tell that's all people want, we'll do it, but usually, they need a professional." The law allows an emergency 72-hour psychiatric hold if someone presents an immediate danger. But they found that more than 80 percent of people brought to the hospital under an emergency hold didn't qualify for the hold, and would be discharged with the added burden of a costly ambulance ride. The only other options officers saw were to escalate to an arrest or just walk away once the situation stabilized. "They knew some individuals very well because they had been to their house so many times and were so frustrated that they didn't have the resources to help this person in any long-term way," said Peterson. While looking at the data in Minnetonka, the researchers also ran into some surprises. As the public and media have paid more attention to high-profile incidents where officers have shot and killed someone, de-escalation training has been touted as one way to potentially reduce officer use of-force. • In Canada: What can we learn about de-escalation from Toronto officer? But researchers found that officers, at least in Minnetonka, were very good at de-escalating in most situations. "It was two neighbors fighting, it was a car accident where people are worked up," Peterson said. "We saw officers using de-escalation literally all day long and on every type of call." They also noticed that more than half the crisis calls last year in Minnetonka were repeat callers. Data shows that police are more likely to use force, including firearms, in situations involving people with serious and recurring mental illness. "When it goes bad," Peterson said, "it goes really bad, but the majority of time it's not going bad." That realization caused the researchers to shift the focus of their training. "We would have gone in super-focused on reducing force, when in reality, it's not something that needed to be a big focus," Peterson said. "What really needed to be a big focus was the repeat calls and the use of hospitalization." They also gave officers a background on the country's mental health system, and how policies developed over decades, such as the closing of large mental health institutions, which put police officers and others on the front lines of dealing with mental health. Densley and Peterson gave an overview of how mental illness and trauma may manifest. And a guest speaker described what it's like to suffer from psychosis and mania. "One officer said, 'When he was saying that when he's manic, he has no idea what he's saying, that was really powerful to me,'" Peterson said. That officer told Peterson that he now thinks back on that when dealing with people in crisis, realizing that they may not even be aware of what they're doing. The researchers introduced the officers to the social and mental health services they'd found in the community, and created a decision tree for how to decide which agency to contact. Those are the numbers on the back of the business cards that officers like Eggleston now carry. "What we were trying to do with these cards is actually just break down some of the stigma," Densley said. "We wanted it to be almost a case of, 'Hey look this is so common that we even carry cards about it.' "
The researchers recently went back and assessed the impact of the training, and plan to return next year to tweak it. Then, Densley said they'll decide how the training might be used in more departments. Chief Boerboom said some officers told him it was the best training of their career. They especially appreciated that it connected them with resources that can help resolve situations that, in the past, would have led to frustrating repeat calls. "While I don't know that we're going to be able to close the loop or bring some sort of closure that would be successful to every single call for the officer," Boerboom said, "We can do a better job of making sure they all feel like what they do every day does, at some point, make a difference."